World Wide Waftage - Wafting Through Our World Wide Travels with Ease, Joy and Simplicity: Family has arrived...Absolutely wonderful! Whale watching at home! Family has arrived...Absolutely wonderful! Whale watching at home! 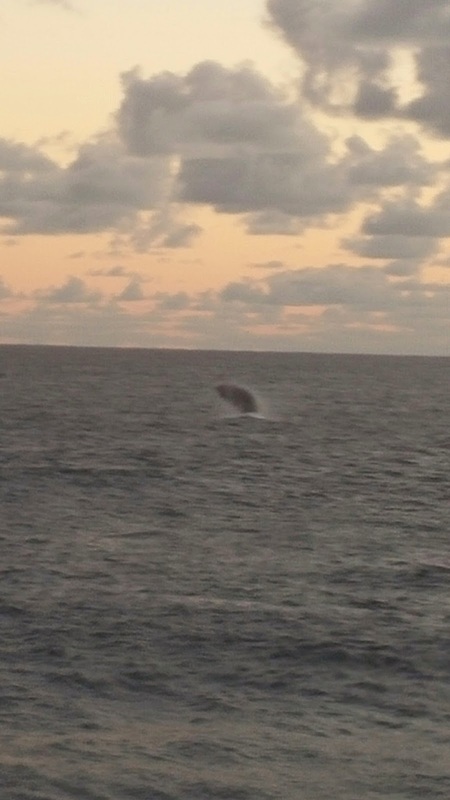 Our first whale in Hawaii, spotted by our grandson Jayden, 9. Good eye, Jayden. And Nik, 14 spotted the first sea turtles. Guess "safari luck" is hereditary. At 6:00 am this morning we heard the animated sound of Jayden's voice outside. Looking out the window, we saw our four family members outside on the patio staring out the sea, squealing with delight. Last night's moon rising over the sea. Tom bolted out of bed to join them, only moments later hollering upstairs to me as I brushed my teeth, to hurry and get outside. In a matter of seconds, he handed me the camera as I stood on the lanai anxious to grab a good shot of a whale they spotted breaching the surface, the steamy blow hole presenting a awe inspiring spray. Last night's moon high in the sky. My heart leapt with excitement. Unfortunately, by the time I got outside I'd missed a good shot but Sarah had the photo we've included today using her smart phone. I guess from now on, we'll be up at 6:00 am looking for the spray of the whales, hoping to get more photos. We lined up six chairs on the patio facing the sea where we'll all sit throughout the day looking for whales, turtles (which we spotted) and later basking in the sun. A coastline view from our drive along the Red Road. In 17 hours since they've arrived, they've seen the moon rise, sea turtles, a whale and a oddly, a hitchhiker which none of us had seen in quite awhile. The moon early this morning. After a great taco dinner last night with a fresh batch made again tonight for dinner, we spent hours laughing and enjoying many of our photos of wildlife taken over the past 26 months since we left Minnesota. Angel Trumpet flowers, the first we've seen in Hawaii. We'd seen these on the island of Madeira, many months ago. Cheryl, one of our readers, wrote to inform us that these flowers are toxic. Stay clear...for looking only! Honestly, it's like never a day had passed since we've seen each other. Instantly, we fell in step, all talking at the same time, laughing and smiling as wide as the face will allow. Bougainvillea on the Big Island. This morning, they'll watch the Minnesota Vikings game on the computer or if we can get it going, using our portable projector. In any case, it will be a great day, as it will be every day as this exciting month has begun. Chicken that wanders our neighborhood. Enjoy our photos of the moon from last night and our solitary whale photo. But, without a doubt, more of each will follow. By the way, people photos will be posted tomorrow. Happy Sunday. It surely will be here. No photos were posted one year ago today, as we wrote about the death of Neslon Mandela which transpired while we were living in South Africa. For details of that post, please click here.